I'm off for a few days to Connecticut for our annual celebrations. I won't be checking comments, alas, but I'll try and catch up when I get back. I do have one post going automatically tomorrow, but next week's a blank slate unless I can hastily throw a few together from a motel room somewhere. It doesn't look promising, though. 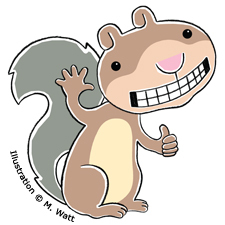 Seth: How did Scaredy Squirrel get into his nut tree? Melanie: Scaredy Squirrel was born in his nut tree. What happened to his Mommy and Daddy? That's *TOP SECRET* information and we will surely find out in upcoming books! Did he ever get his emergency kit out of the poison ivy? How did he do it? Yes, he did, he waited and waited until it snowed and retrieved it in the spring. Will Scaredy Squirrel ever have a girlfriend? Maybe~ but he's very shy so it might take a while! What happens to the fish in "Scaredy Squirrel Makes a Friend"? He lives happily ever after with his other goldfish friend. Check it out~ You'll see, there are 2 goldfish in the fountain! How did Scaredy Squirrel get the flamingo and all the gnomes for his pretend beach? Scaredy Squirrel always has his stuff delivered to his tree by mail or by FedEx. What happens next to Scaredy Squirrel? Scaredy Squirrel will now be heading to the beach. And again, he will have to face his fears of mobs of lobsters, tons of falling coconuts and packs of pirates~ ARRGH! It should be fun! Why does Chester always want to be the star? Chester is just really convinced that he~s the best at everything, including writing and drawing children~s books! And therefore, he considers himself to be a SUPER STAR! Just watch and see in Chester's upcoming book: Chester's back! It will come out next fall~ and he's even more demanding than in the first book! Why is Chester mean to the mouse? Chester always wants to have his own way! It might come off as mean but it~s mostly because he really needs to work on his manners! Will the mouse ever get a whole book? What I can tell you is that Mouse will be in the sequel whether Chester likes it or not! I get inspired by all kinds of things~ Like animals, people around me and memories from my own childhood. I like to sketch new ideas and focus on topics that interest me and that I think kids can relate to! There's another podcast to add to my little list (on the sidebar to your left; scroll down a tad). Sabrina Weissler of "Children's Book Radio" brings new interviews and discussions with authors and illustrators for our online listening pleasure several times a month. Okay, she's not really new. She's up to Episode 39, in which she gives me a shout-out, with all kinds of flattering and obviously untrue things about Book Buds. *blush* Check out the full index. There are some familiar names on her list, like Jane Yolen and Kadir Nelson, if you wanna give a listen. Authors love to blab about their books, and it's a little like having one come over and chat for a while. Sabrina's interview style is very relaxed and non-intrusive, so you get plenty of the subject's personality shining through. I feel incomplete without a cup of tea in my hands though (longtime readers know I'm an addict). Oh, and here's the link again.